The president's daughter and senior adviser, on a four-day trip to promote a White House global women's project. 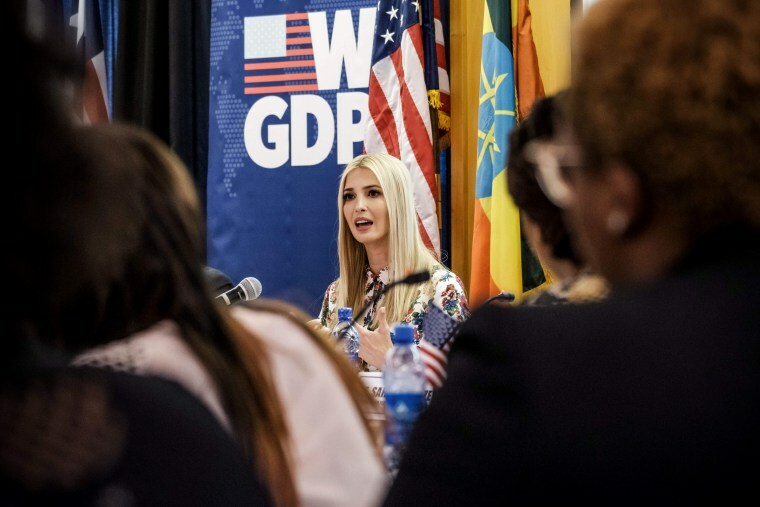 ADDIS ABABA, Ethiopia — Visiting Africa to promote female economic development, Ivanka Trump on Monday sought to spotlight laws and customs that hold women on the continent back, from restrictions on property ownership to gender-based violence. The president's daughter and senior adviser, on a four-day trip to promote a White House global women's project, spoke about roadblocks for women during a policy discussion with Ethiopia's president and after signing a joint statement with the African Union Commission. "We can and we must address these barriers to women's equality and countries' prosperity," Trump said during a panel discussion held at the headquarters of the U.N. Economic Commission for Africa. She pointed to the limited number of female landowners on the continent and said some countries have laws allowing men to block their wives from working. In the agreement, the United States and the African Union Commission pledged to help empower women and to fight problems such as child marriage, human trafficking and sexual abuse. She signed it at the commission's headquarters along with Kwesi Quartey, the commission's deputy chairman. Trump highlighted the "collective goal" to eliminate gender-based violence and stressed the shared focus on improving access to education and business opportunities. Trump met separately with both leaders Monday, sitting with Zewde in a formal room at the presidential palace. "I can say that you came at the right time. Africa is on the rise," Zewde told Trump as the two participated in the panel discussion before a packed, largely female audience. During the event, Trump and David Bohigian, acting director of the Overseas Private Investment Corporation, announced a new financing initiative for women in Africa. Known as OPIC 2X Africa, the effort will directly invest $350 million — and seek additional private investment — in businesses and funds owned by women, led by women or working to help women.